Sent out a tweet of this post to my followers. The thing is, I realized this on my own at age twenty, at my house. 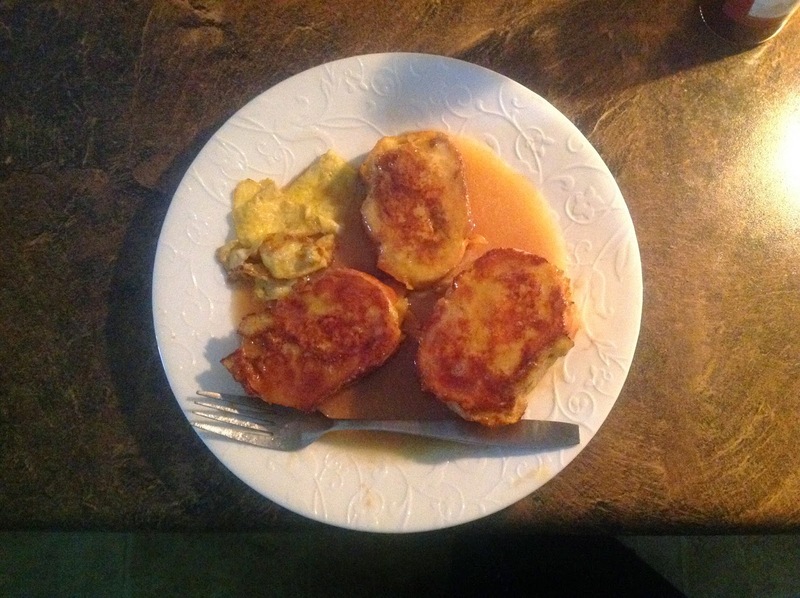 All I had was stale bread and that turned out to be the best pain perdu I ever tasted. Becuase the bread was so dry, lost as bread, it soaked the egg like a sponge. The bread became hardly manageable at all. Without a spatula that covers the entire piece of bread and careful lifting onto the pan, the whole thing is loaded, so fragile, it falls apart as you move it. Once heated the egg holds its shape and it can be flipped. It is the exact same thing as soufflé, the exact same ingredients, except in different form, bread instead of sauce, the bread and milk become the sauce, and the egg is whipped as far as you took it. A flattened soufflé if you like. This item fits in the category of brilliant things that French do with stale bread. Their bread lasts only a day, so stale bread is used 1,000 inspiring ways. Chip -- did it ever occur to you, the close likeness between French bread and bread pudding? The other night, when I achieved perfect French-toastiness, I realized it was a millimeter away from bread pudding. I am going to experiment with this. Eileen -- I really love maple syrup. There is no other flavor like it. Not honey, not cane sugar, not caramel -- all good flavors. Does everyone love it that much -- like bacon? This is a great and simple recipe. I do this camping and it is a big hit. Two things: (1) let the bread slices dry out for a day our two before using to make the toast. This also makes the uptake of the egg mixture better and more consistent. (2) put the maple syrup and butter in a large coffe mug in your over on low as the very first step you do. Put the cup on a plate in the oven on low setting. The butter will melt, the syrup will warm as will the plate. When you are ready to serve the toast pull the plate and syrup fron oven using a hot pad and plate the toaste and pour the syrup to taste. If you are making several toasted for friends you can put the slices on the plate in the oven and cover with a tea towel until ready to serve. I once had Mexican corn bread made as French toast, topped with salsa and sour cream. It was a nice variation! Such as? A post on how to mix the perfect ____. Would be fun.